The last thing Stephen and I said to each other last night before we went to sleep wasn’t “sleep well” or “see you in the morning” but “mmm, salmon”. Not the most romantic end to the evening but fairly typical. We swing from being incredibly organised about what we’re going to eat during the week to not having anything planned at all and, when there isn’t a plan, we often end up talking about what we’re going to eat for dinner before we go to sleep. This was one of those nights and somehow, we decided on salmon (which, coincidentally, is exactly what we ate this time last year, albeit in a different style). Although I can’t remember how we decided upon salmon, I do remember that it had to be Indian style since we made a vat of dal at the weekend that doesn’t fit in the freezer. It was good dal but needed something spicy and rich to accompany it, which is exactly what this fish provided. We had some plain rice and some greens sauteed in garlic and lemon alongside the salmon and dal which rounded the whole dish out well. Indian style fish isn’t something I’ve eaten a lot of and, when I have, it’s tended to have a curry-like sauce with it. This was a dry rub which I found slightly unusual to begin with but really enjoyed once I’d got used to the texture. It definitely needed a stronger fish like salmon to carry all that spicing but something like mackerel would work too. Combine all the dried spices with the salt and pound in a pestle and mortar. Squeeze the lemon juice over the fish before coating with the spices. 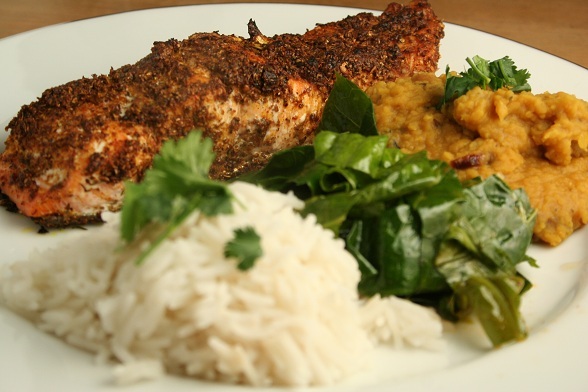 Subscribe to comments with RSS	or TrackBack to 'Indian Style Baked Salmon'. What a lovely looking dish and it seems pretty easy and quick to do. I’ll definitely give it a go, salmon is very popular at home. I came across this post through a Google search and have just made the salmon. This has compelled me to comment and tell you just how much I enjoyed it!! Thanks very much – it’s definitely a recipe I’ll be adding to the repertoire! I’m glad you liked it Miranda. And thanks for the message, I’d forgotten about this dish and it could well be a potential for tonight’s dinner! I hope you like it, GC.